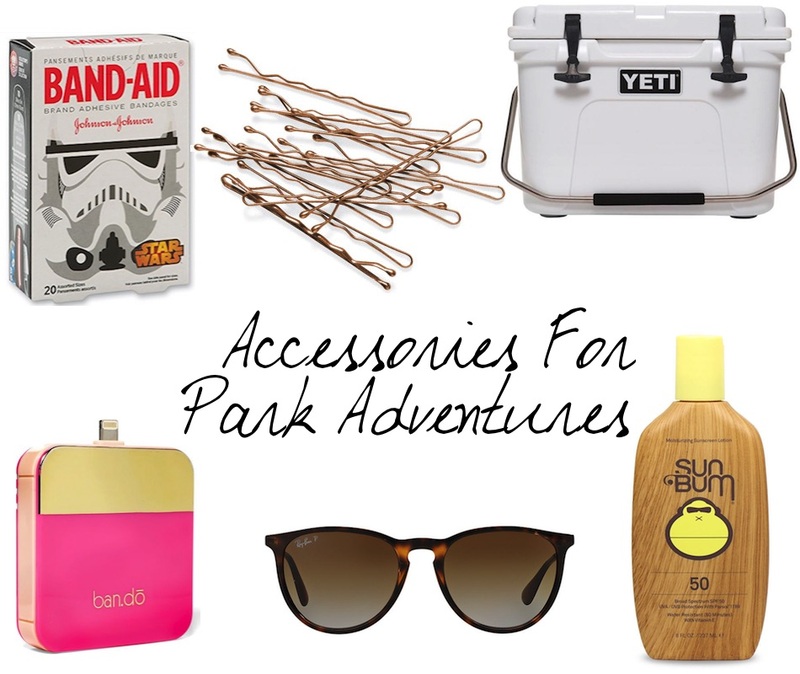 Continuing the Park Adventure Series here on my page I decided to give you some tips on the accessories you should pack for a day in the park. There were something that I wish I had brought and some items that I'm happy that I had with me. Remember, these parks are an all day thing so make sure you're only carrying what you need. One // Let's start with the backpack. A backpack is a great thing to have versus a purse because it's bigger and it rests on both your shoulders versus one. Plus, it's not a "too girly" thing so you can make the guys carry it around too! Don't bring anything too expensive or that you would be upset if it got wet or dirty. A simple Jansport bag will do just fine! Two // A cooler. I can't believe my friends and I didn't know that we could bring coolers into the park. We could have saved so much money on food. We would eat once or twice a day in the park plus snacks and water throughout the day. Your passes (at least at Disney) allow you to come in and out of the park all day. So you can leave the cooler in the car if you want! Three // I'm sure most of you know this one by now, but a portable charger is key. Especially since you'll be on your phones all day, taking pictures, checking text, Facebook..etc. Bring a backup battery source so you're not scrambling for a wall outlet and missing out on the fun! Four // Now, some parks (like Disney) won't allow this next item but some just might, but bring a selfie stick. It can get exhausting and time-consuming asking random people to take pictures of you and your gang. Just buy a $8 stick that can shrink down and fit in your bag. You'll get some cool group shots with it! Six // An extra pair of socks might also come in handy if you plan on getting on water rides! You'll most likely be wearing some sort of sneaker and you might get your feet wet. Wet socks are so uncomfortable, so having an extra pair to change into would be more comfortable! Seven // Again, if it's hot out that means it's sunny. Bring sunglasses or a hat to protect yourself and help you see! Eight // Cash. I ALWAYS use my card and NEVER have cash. Something I definitely learned though is to bring cash if you're in a big group. Especially if you're all chipping in for something like food or gas. Also, make sure all your stuff is in your wallet. Not just in a pocket in a bag because it could easily fall out. Also, clean out your wallet! Only bring your important cards, you don't need your Target card at Disney. Nine // A plastic bag. Okay, so we were about to go on this water ride but I was scared that my camera was going to get wet. So we went into a gift shop and I asked for one of the bags and put my camera and electronics inside of it then tied it up then put the plastic bag inside my book bag! It was quite genius if I do say so myself! Ten // A camera! I mean, duh. It doesn't matter if it's your phone, your digital camera, or a polaroid. Bring something to capture those moments! Twelve // A water bottle. At Disney, you could go just about anywhere and they will give you free water. Take advantage of this and don't waste $4 on a Dasani water bottle! These are just some key items I will remember to bring next time! Did I forget anything? Let me know by commenting below.